A hot summer's day begs for something cold. Oh, we could sip on a cold drink but nothing says 'Summer' like a bowl of homemade ice cream. So try this delicious Orange Ice Cream that is perfect on its own, or with fresh fruit. I adapted this Orange Ice Cream recipe from Marjorie Kinnan Rawling's delightful book "Cross Creek Cookery". It is so easy to make as it's doesn't use a custard base. So that means it does not contain eggs, only cream, freshly squeezed orange and lemon juice, sugar and vanilla extract. So there is no 'cooking' involved; just mix all the ingredients together, chill in the refrigerator, and then process in your ice cream machine. Think of it as an "iced" cream, as that is how I would describe its lovely grainy texture (like a sherbet) that has a wonderful orange citrus flavor. A few notes on ingredients. Any variety of sweet oranges can be used to make this ice cream. For reference, I used about 3 pounds (1.4 kg) of mandarin oranges to produce 2 cups (480 ml) of orange juice. I also like to add a little lemon juice as I think it enhances the citrus flavor. Cream is the fat that rises to the top of whole milk. It has a smooth, satiny texture and is labeled according to its butterfat content (heavy to light). When making this ice cream, use 'Heavy' Cream or Heavy 'Whipping' Cream which means it has a 36 - 40% butterfat that will double in volume when whipped and hold its form. The other cream used in this ice cream is Half and Half Cream, which is made of a mixture of cream and whole milk and contains between 10 - 18% butterfat. 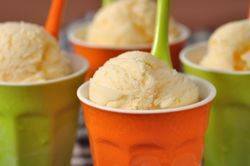 Orange Ice Cream: In a large bowl or measuring cup combine all the ingredients. Cover and place in the refrigerator until it is completely cold (several hours or overnight). Transfer the mixture to the container of your ice cream machine and process according to the manufacturer's instructions. Once made, transfer the ice cream to a chilled container and store in the freezer. If the ice cream becomes too hard, place in the refrigerator for about 30 minutes before serving so it can soften. Heavy Cream or Heavy "Whipping" Cream contains 36 - 40% butterfat.